The logical progression of a fencing phrase can be described in terms of the short and long tactical wheels. These are re-produced below but please be aware that they only provide a partial tactical understanding of the concepts involved based on first intention actions. These actions are those that the fencer intends to work without the unwitting help of the opponent. The tactical wheels ”view” of the logic of fencing phrases is closest to reality when fencing the two weapons governed by the ”Right of Way” convention in the rules, Foil and Sabre. Please see the ”Key” to help interpret these diagrams. The arrows in the diagrams are equivalent to the phrase “is over come with a … action” where … stands for the next action around the wheel. So if Fencer A tries and succeeds in scoring a hit on Fencer B with a Direct Simple Attack from the perfect distance, this was a 1st intention attack by Fencer A. Another example would be if Fencer B let’s the same situation on the piste happen again and when Fencer A tries the Direct Simple Attack again Fencer B will be able to employ a Parry to defend the attack and immediately follow this with Riposte to score. This was Fencer B’s 1st intention, just to make the riposte succeed. This basic logical progression shows the actions that can make up a simple fencing phrase. 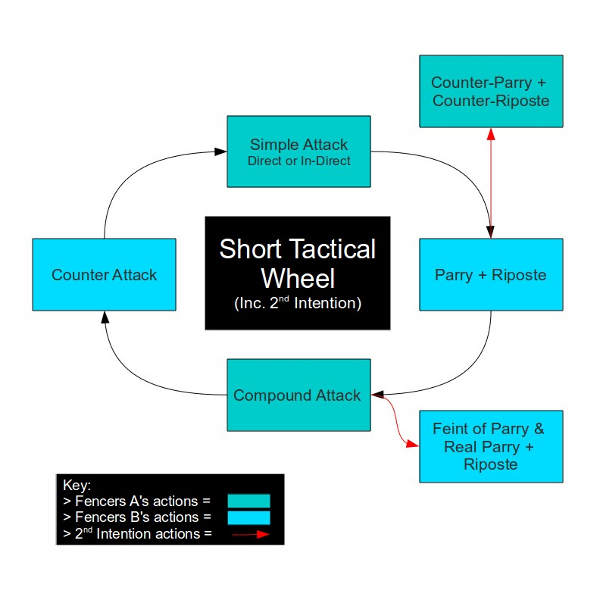 These tactical wheels can therefore be used as a guide to fighting a bout or constructing a lesson plan at the beginner/intermediate levels, where only first intention actions are employed. 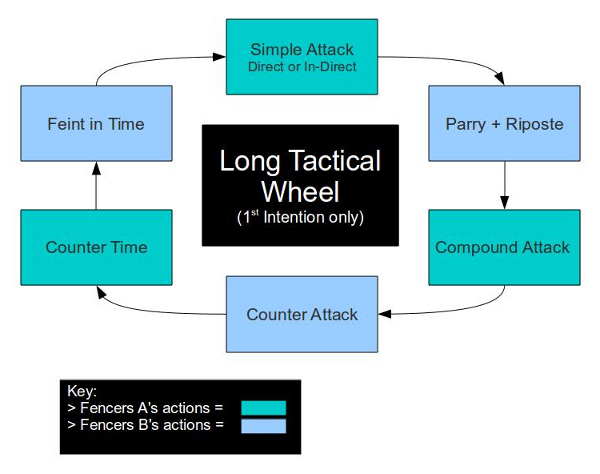 The Long Tactical Wheel shows a slightly more advanced logical progression of actions in a fencing phrase. However, a greater appreciation of distance and timing together with a higher technical ability is required to accomplish the moved in the latter stages of the wheel. This too can be used as a guide to fighting a bout or constructing a lesson plan but at the intermediate/advanced levels employing first intention actions. Please be aware that not all logical tactical progressions a depicted here. 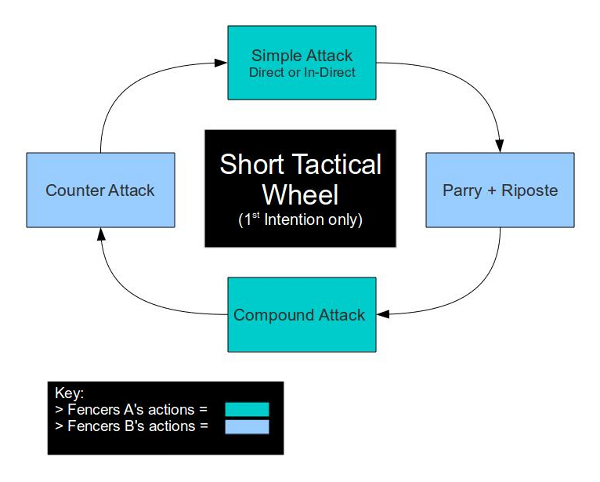 For instance the answer to a compound attack can be a compound parry (a series of simple parries). Neither should it be assumed that the logical progression should start with a simple attack. A Lesson plan need not include every stage to be effective training. Here Counter-Parry Riposte and Feint of Parry followed by a Parry Riposte have been included as examples of the many actions available. To make the second intention action work Fencer A must provoke the same a response from Fencer B as in a first intention attack. Fencer A’s action is designed to fall a little short of Fencers B’s target, this will mean that B’s counter action, the Riposte, has further to travel, will take longer to complete and is easier for A to Counter-Parry and Counter-Riposte to gain the score. 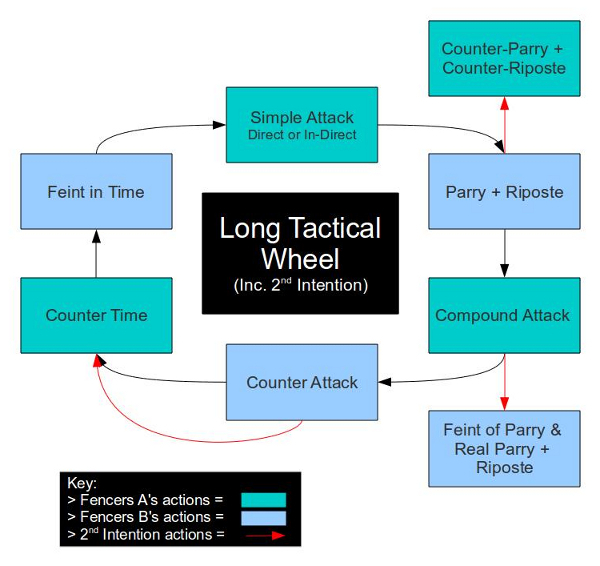 Here Counter-Parry Riposte, Feint of Parry followed by a real Parry Riposte and a premeditated Counter Time action have been included as examples of second intention actions, many other actions are available, too numerous to allow a clear diagram to be drawn. This shows that a fencer at an advanced level can and should be capable of switching between 1st and 2nd intention actions during a phrase. This can be done in a predetermined way or as a result of a decision made during the phrase. Use of tactical wheels during individual lessons or pairs training is very stimulating and enjoyable for both the fencer and coach. The possible combinations are limitless but only a few should be used in any single lesson. The goal is to build capacity not overwhelm the fencer.